Unregulated car parking for the Ambulance HQ across where a new path could be constructed inside the brick wall along Balmain Rd. Also note the narrow footpath and only one car parked on the road. 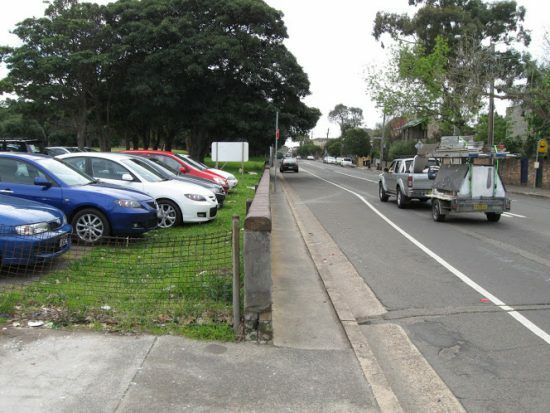 A wide bike lane could be created if parking was removed on this side of Balmain Rd. Callan Park is a large area of public parkland, recently handed over to Leichhardt Council by the State Government (although they are still haggling over the final details and as of March 2017 still do not have control). The Council has developed a Plan of Management, which has yet to be approved by the State Government. See photo essay, and a Google Map with comments. Recreational and sporting clubs were asked to nominate facilities that could be provided or improved in Callan Park. LBUG identified a cycle path inside the brick wall along the Balmain Rd/Darling St frontage, along the line of a dirt track between a row of shady trees. This could run from the Ambulance HQ car park to the main gate at Cecily St, providing almost a kilometre of off-road alternative to the busy main road. A further connection is available behind the Ambulance HQ via Garden Way, to connect with Wharf Rd, and then to Balmain Rd at Perry St. See map. The path along Balmain Rd frontage was included in the Draft Masterplan but was dropped in the final Masterplan, without consultation. The Council has approved sign posting a route on internal roads, from Garden Way off Wharf Rd to Cecily St gate, which would be a low stress alternative to Balmain Rd. There is a need for a children’s learning circuit in the area, and a place in Callan Park could be found- such as the flat grassed area next to Balmain Rd, opposite Alberto St. Another good area on a quiet weekend is the car park behind the Kirkbride Building (western side of the main College of the Arts building). This car park is huge and flat and is not used much on weekends- ideal for youngsters to learn on. Anthony Challinor at Velofix in Rozelle has put forward the idea of holding a bike race around the main building (a criterium, or circuit race). This would be run by the professional road racing clubs, with full insurance etc to cover the event. Please write to the Council supporting the above. (can email the mayor at dbyrne@lmc.nsw.gov.au), or contact your local councillor, and email the council as below. LBUG final submission is here (done in conjunction with Bike Sydney).